Starting this morning I’ve been involved with food nonstop, getting as many things ready as I can for Christmas dinner for eight. A lot of that time was spent online and in my recipe files nailing down the recipes I want to use for different parts of the meal. I have both butternut squash and broccoli from our garden, so had to decide what I wanted to do with those. Since broccoli cooks so quickly and can reach the point of no return in an instant, I knew I didn’t want to chance that with my painstakingly-nurtured organic florets. So it will be broccoli slaw. We all love it and what could be better with turkey and corn bread dressing? And I’ve peeled and chopped the butternut squash with apples, brown sugar, butter, and cinnamon, and will bake it kind of like this recipe. I’ve already made the 2 pans of corn bread and broken that up, then mixed in chopped fresh herbs from my herb garden (yep, parsley, sage, rosemary, and thyme!) and then added in the chopped onion and celery. That’s been popped into the fridge for final assembly Christmas day. Refrigerator rolls have been made ahead as well. My sister, who no longer makes big family meals at her house and deservedly so, requested that I do her recipe for Angel Biscuits, a popular Southern recipe using both baking powder and yeast. They are wonderful, so of course I said I’d do them. But there’s an added twist. We got our heads together and decided they need to be something along the order of Red Lobster style garlic cheese biscuits. So I looked that up online and added a ton of cheese and garlic to them. Though this recipe just starts with basic biscuit dough, I adapted it to my angel biscuits. Yum! Other family members are bringing all the desserts, and that makes me very happy. I prefer just plain old food. Needless to say I haven’t been in the studio today, and won’t be getting in there over the holiday weekend. The kitchen is a very creative and cozy place right now. 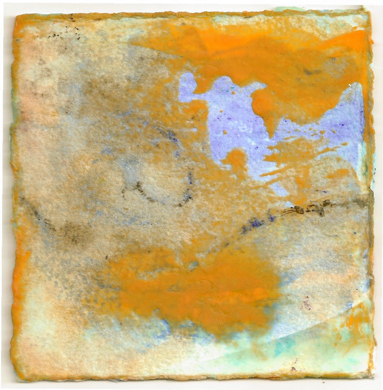 But for my show and tell today, I leave you with these little 5″ square encaustics that I did a long time ago, in my former kitchen that often doubled as an art studio. It’s amazing to see them again after quite a while. That’s because I’ve lost the actual pieces (in the move!) and just stumbled on them on my computer. They make me want to haul out the wax again. 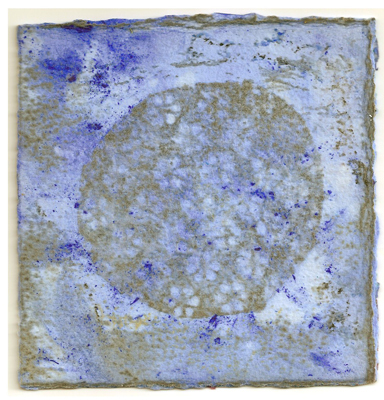 Aura - Encaustic on 300# Arches Paper, 5x5"
Balancing Act - Encaustic on 300# Arches Paper, 5x5"
Blue Lace - Encaustic on 300# Arches Paper, 5x5"
Night Windows - Encaustic on 300# Arches Paper, 5x5"
Horizon - Encaustic on 300# Arches Paper, 5x5"
Scatter - Encaustic on 300# Arches Paper, 5x5"
Topography - Encaustic on 300# Arches Paper, 5x5"
Wishing you Happy Holidays! See you next week. Martha, one last comment before I go. 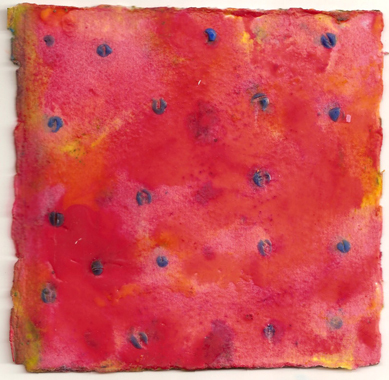 These encaustics are lovely. There is so much I don’t like about encaustics. I’ve seen so many ‘rubbish’ pieces that have made other people swoon….. These show me that there really is a place for the technique. You say that you have lost them. Maybe you can use the images in your digital art. Must rush now. The final presents to wrap! Thank you for that, Myfanwy. I continue to hope they’ll turn up somewhere in my studio. But I might very well be able to use the images, because they were scanned at a fairly high resolution. Thanks for the suggestion! Merry Xmas Martha. 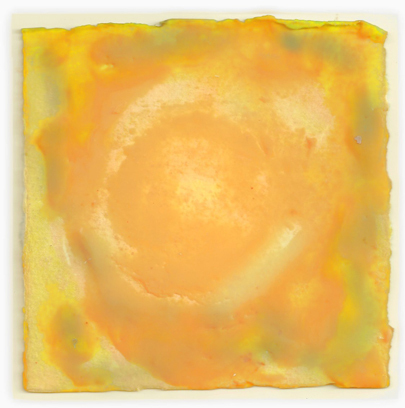 Nice encaustics. I am sure your Xmas dinner will be enjoyed by all. Thank you, Tony. Happy Holidays. 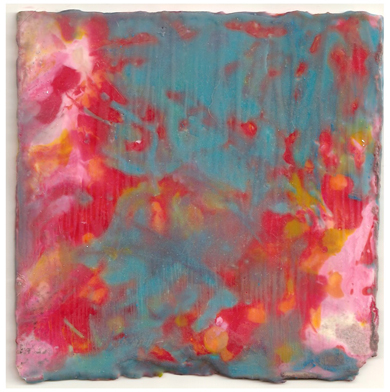 Yummy…both the food and the encaustics! Thank you for sharing. Merry Christmas Martha to you and yours. 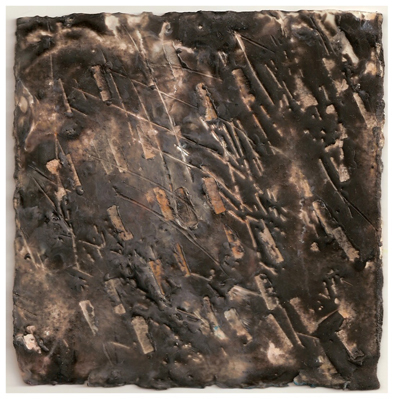 The encaustic pieces are great. I really like the names for each of them. 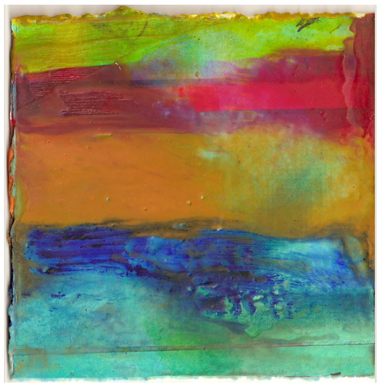 I haven’t worked with encaustic yet, but I have been wanting to. You have inspired me to think about getting the materials ready that I need to begin. Merry Christmas to you and your family. Deb, it’s the most wonderful thing to do. I’ve been thinking hard about doing it again. There are a lot of things to love about them, and one of the most fun things is that you can just let them harden in their individual containers when you want to stop working, even with the brushes standing up in them, and reheat them when you want to work again. Glad you liked these. Martha, your dinner sounds wonderful. Please share photos of your feast. I’m from Canada so the cornbread doesn’t happen up here but I need to investigate that for another holiday dinner. Are you Angel Biscuits similar to Paul Deans?? We are having our dinner for 11 tonight. Buster the turkey is in the oven as I write. Have a very Merry Christmas and I look forward to staying connected with you in 2012. Enjoy your dinner, Lottie! I’ll bet your kitchen smells divine right about now. Yes, they are basically the same angel biscuits. This is actually the first time I’ve ever made them, but I’ve had my sister’s several times. They are wonderful! Merry Christmas! PS – I’ll definitely take some pictures and hope you will too!